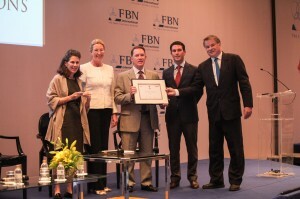 Huber CEO Mike Marberry (center) accepts the 18th annual IMD-Lombard Odier Global Family Business Award in Rio de Janeiro at the 24th Summit of the Family Business Network International. We have great news to share! J.M. Huber Corporation — parent company of Huber Engineered Materials — has been awarded one of the most prestigious awards for a family business: the IMD-Lombard Odier Global Family Business Award for 2013. Awarded by IMD, a top-ranked global business school based in Switzerland and Lombard Odier & Cie, a leading private banker in Europe, the annual prize recognizes a company that unites family interests with those of the business and combines tradition and innovation while demonstrating a clear commitment to the local communities in which it operates. In addition to Huber Engineered Materials, Huber’s porfolio of companies includes Huber Engineered Woods and CP Kelco. Past winners of the award include the Merck Group, S.C. Johnson Enterprises and the LEGO Group. This is an honor we are extremely proud of and is also a testament to the outstanding efforts of Huber employees worldwide and the support of our customers.